Lay Counseling – CounselCare Connection. P.C. Lay Counseling Certificate Course for learning Christian lay counseling skills. Check out CounselCare Connection’s Church Lay Counseling Training Program! Because of your desire to counsel and guide individuals – you may be seeking a deeper understanding of people and the skills to be a more effective people helper in your church or organization. At CounselCare Connection, P.C. we now offer the Lay Counseling Training Certificate Course. This course can now be completed by reading the NEW expanded manual, listening to the Lay Counselor Training Seminar on audio CDs (approx. 4.5 hours) by Lynette Hoy, NCC, LCPC and Steve Yeschek, LCSW presented at Calvary Memorial Church in Oak Park, Illinois. 2. Audio Learning CDs: 5 lay counseling training audio CDs with Steve Yeschek, LCSW and Lynette Hoy, NCC, LCPC. 3. One (one hour) domestic violence audio CD presentation and hand-outs by Lynette Hoy, NCC, LCPC, Domestic Violence Advocate. Presented at the American Association of Christian Counselors conference in New York. 4. Lay Counselor Certificate awarded upon completion of application, final exam, statement of faith and recommendation from a pastor or ministry leader. Learn R.E.A.L. helping skills to… Reach, Encourage, Assist and Lead hurting people or those in crisis. ….How can I help someone in crisis? ….What will help me overcome the fear I have about helping? ….How can I identify when someone needs more help than I can give? ….How can I demonstrate empathy and know when to refer? ….What is the Christian counseling process and how does it differ from secular psychology? Pay for course below or Email Lynette Hoy , NCC, LCPC with any questions or to place your credit card order by phone: 630.368.1880. The lay counseling program and manual includes the necessary material students need for their personal study. The Audio CDs include presentations from the Lay Counseling seminar held in Oak Park, Illinois at Calvary Memorial Church with speakers: Lynette Hoy, NCC, LCPC and Steve Yeschek, LCSW. 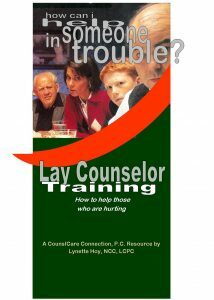 Lay Counseling Training CDs: Teaches how lay counselors can effectively intervene, support and refer hurting people family members, friends or church attendees who are struggling with personal and relational issues and/or may be in crisis. Presentation includes “R.E.A.L.” helping skills. How to: Reach; Encourage; Assist and Lead people in crisis. Order this course by calling Lynette Hoy at 708.341.5438, to pay by credit card through Pay Pal. You will be paying CounselCare Connection, P.C. www.counselcareconnection.org 1200 Harger Rd., Suite 602, Oak Brook, IL 60523. Read about the Church Lay Counseling Curriculum!